The Hotel Rethymnon Mare is located in the area of Scaletta, just 11 km from the bustling town of Rethymnon on the island paradise of Crete. Scaletta is a tourist area next to the beach with hotels, taverns, restaurants, bars and shops. Only 100 m from the long sandy beach, this is a terrific haven for couples and families with 152 single, double and family size rooms boasting a host of amenities. Guests to the Hotel Rethymnon Mare can discover marvellous beaches and sleepy villages along with a wide array of shops, restaurants, traditional tavernas and "ouzerias". Heraklion Airport is 65 km from the hotel and Chania Airport 75 km. Local Tips: Rethymnon still maintains its old aristocratic appearance, with its buildings dating from the 16th century, arched doorways, stone staircases, Byzantine and Hellenic-Roman remains, small Venetian harbour and narrow streets. Food, drink and entertainment: All Inclusive accommodation. The hotel offers two restaurants, two cocktail bars, two pool/snacks bars, a Chinese a la carte Restaurant, and a disco. The main restaurant Hermes seats up to 200 persons and has beautiful views of lush gardens and the Cretan Sea. 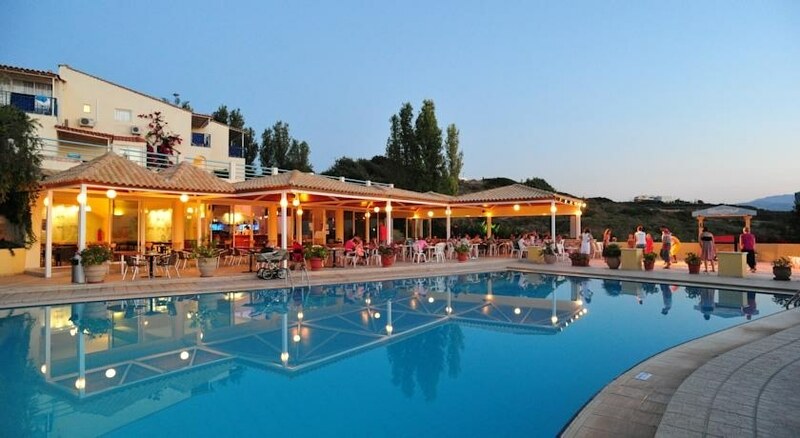 It offers show cooking, rich buffets with a large variety of delicious hot and cold Greek, Cretan and International dishes. The Chinese a la carte Restaurant Jasmine, which is at no extra chargeoffers a wide range of tasty chinese specialty's. Entertainment includes Greek Night with live music & dancers, Jazz Night, Creten Night, Dance Night, piano night, Cabaret show, Fakir show, and the Miss and Mr. Rethymno Mare show. Sports, games and activities: Two Large Swimming pool with separate pools for children with sun beds and umbrellas, room for table games and card room, TV lounge, backgammon, chess, darts, archery, air gun shooting, mini golf, tennis court, ping pong, badminton, bingo, Internet corner, cards, board games, children's playground, mini club, animation team, massage services. Additional: 24 hour Reception, laundry service, Wi-Fi connection to Internet all over the hotel (free of charge), Internet Corner (at extra charge payable locally). Mini Market, Jewellery shop. The hotel offers a beach towel service (deposit payable for each towel). Due to the hillside location of this property it is not suitable for guests with wheelchairs or those with walking difficulties. The Hotel Rethymnon Mare features 152 guestrooms in various sizes & types, all with a panoramic view of the Cretan Sea, the White Mountains, or the hotel’s swimming pools and the gardens. Standard rooms with Garden view or Sea view can accommodate comfortably up to 3 adults or 2 adults and 1 children or Sea view rooms which can accommodate up to 3 adults or 2 adults and 2 children , while Family rooms can accommodate a family of 2 adults and 2 children or 4 adults. All rooms have a private bathroom with music and telephone, hair dryer, safe deposit box (at extra charge payable locally), Satellite TV, radio or music channel, direct outside telephone-line, refrigerator, and Wireless internet connection and individual air conditioning for heating and cooling at no extra cost.